The manufactured “folk art” of Pierre et Claire Inc.
Last Saturday at Christie in anticipation of this article, I looked to see how many animals I could find which were manufactured by this small Quebec company. Although it was too hot to cover the entire field, I did manage about ½ of it, and in that area I found five. I noted that we as Old Church Trading had painted three of the five. This gives you an idea of the scope of production of this company. Rene Beaudoin was one of the original, and possibly the most successful of the Quebec pickers which started up in the 1960’s in the Victoriaville region of Quebec. There were several small farms in the region, and everyone seemed inclined to keep all the old furniture and accessories as it was replaced in the barns, basements, and attics on the property. The popularization of antiques brought in part by Expo 67 signaled the start of the antique picking industry, and Rene, although reportedly not able to read or write, had a keen understanding of business and quickly became the main man, hiring several men to go out and knock on doors, and they fetched all and everything available, bringing it back daily to his large farm near Defoy. After becoming enormously successful in the antique trade, in 1978 he decided to create a small manufacturing business, employing some of the wonderfully talented wood workers of the region to create high quality reproductions of antiques, and copies of wood carvings which were prevalent in the area. In 1983 his daughter Claire, who is married to Pierre Trudel, bought the company from Rene, and thus Pierre et Claire Inc. was formed. 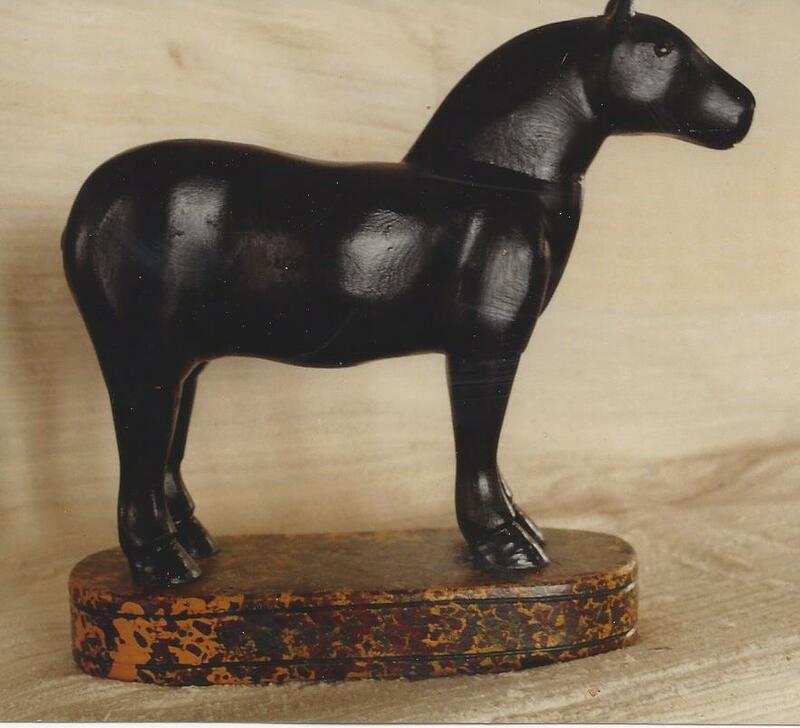 The company exists to this day at its original location of 1197 Rue Principale, St. Anne Du Sault (Defoy), Quebec, and continues to manufacture reproductions of antiques and animal carvings with about five full time employees. When we discovered them back in the early 80’s we decided to set up a mail order business for the animals which we called Old Church Trading. We advertised in Harrowsmith magazine in Canada, and Country Home magazine in the States. 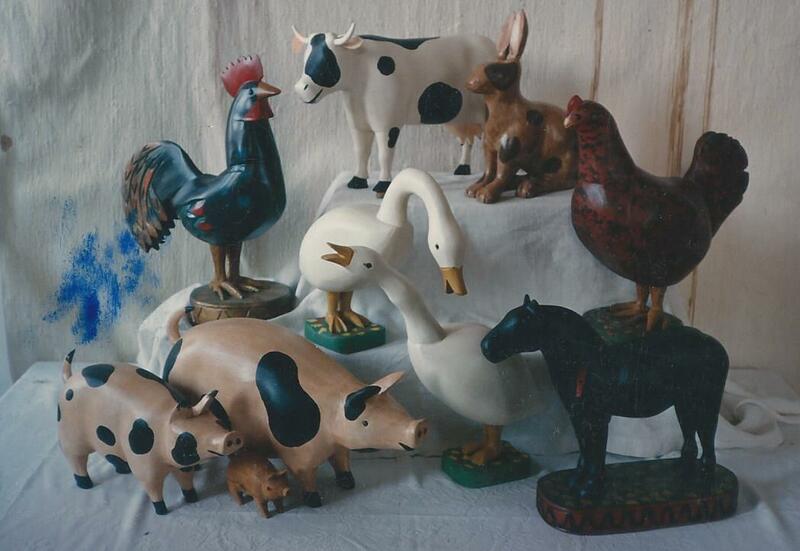 We offered many different animals both in the sanded, unfinished state that we bought them in, and varnished or painted which we did ourselves. We sold hundreds of them both through mail order, and at the Harbourfront market in Toronto, which we attended every Sunday. 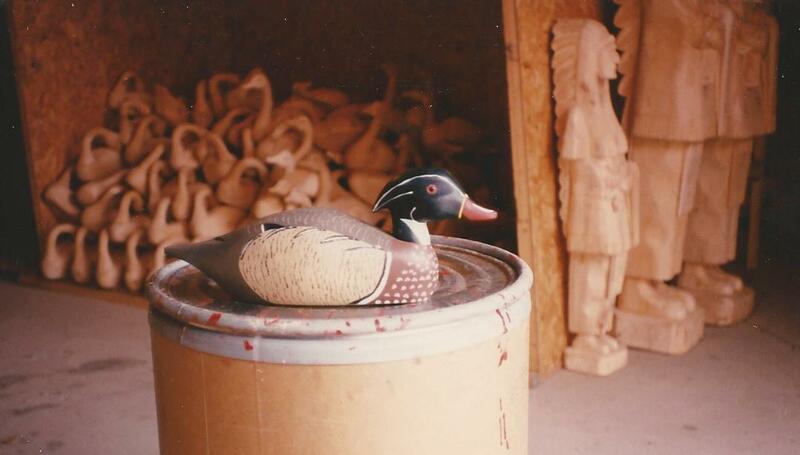 At the time it seemed everyone wanted a nice pine, carved goose or swan to sit on their harvest table or cupboard. 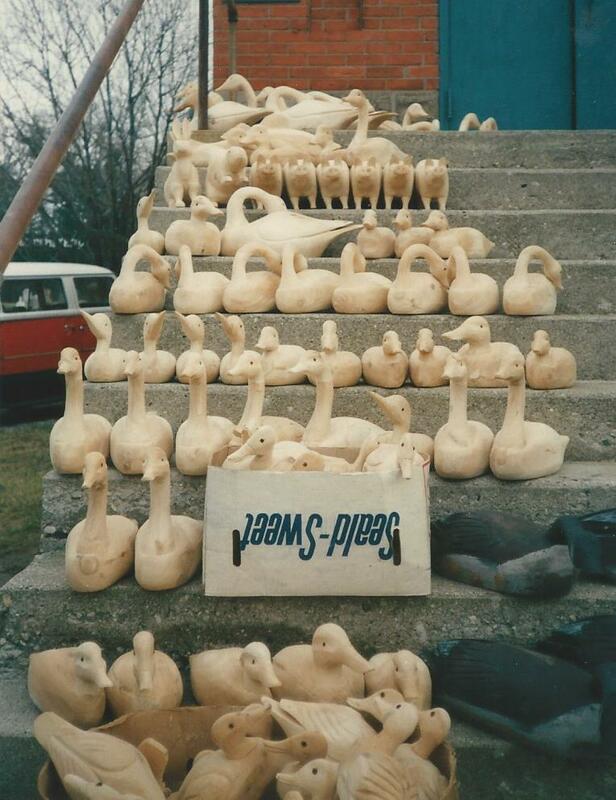 We would stop in every other week or so and fill out our orders, going through the bins of carvings and picking out the nicest ducks, geese, swans, loons, roosters, and other animals. We were always interested to see what new models they would come up with. Penguins, buffalo, bears etc. would appear. The prices were always reasonable. I recall the standard size goose would cost about $16 each. Although there was some variation in quality, (sometimes they would have large knots, or be slightly malformed) overall they were very nicely done. Initially, all the models were cut out from solid pine, but sometimes these pieces would crack with time, especially if they were not adequately finished, so eventually they started to offer laminated models at a slightly higher price. This solved the cracking problem, but didn’t look as nice and natural in varnish. Of course they were the best ones to buy for painting. 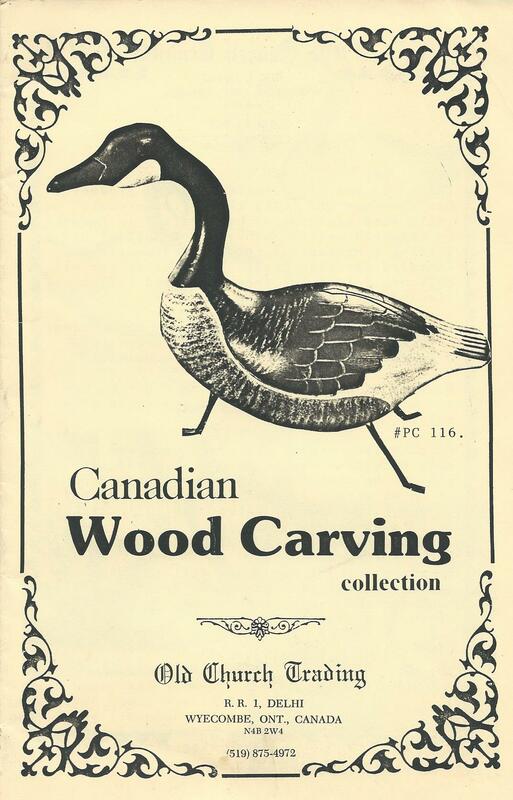 As far as I know this small company was, and is the only North American company to “manufacture” folk art type carvings. 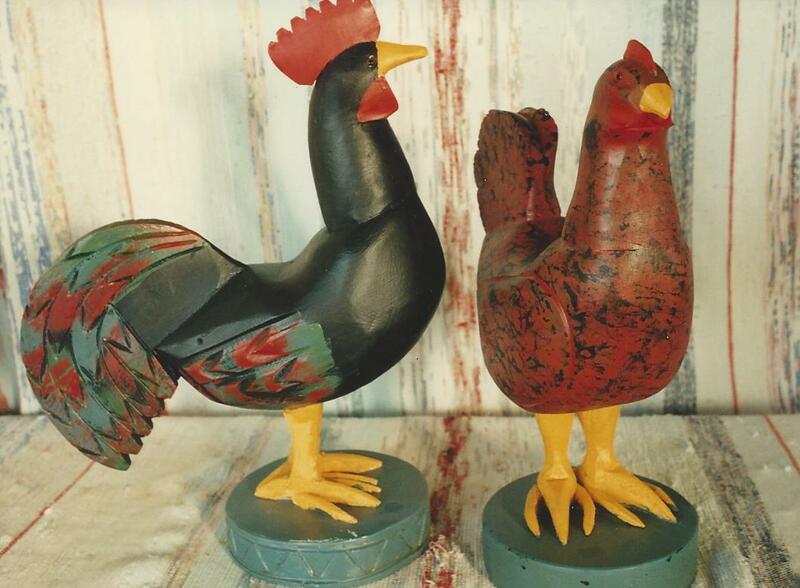 Although by the fact that they are manufactured and mass produced they cannot truly be considered as folk art. And yet you cannot really call them reproductions either because in many cases they are an original design. For folk art collectors it is important to know of these carvings, and be able to spot them. 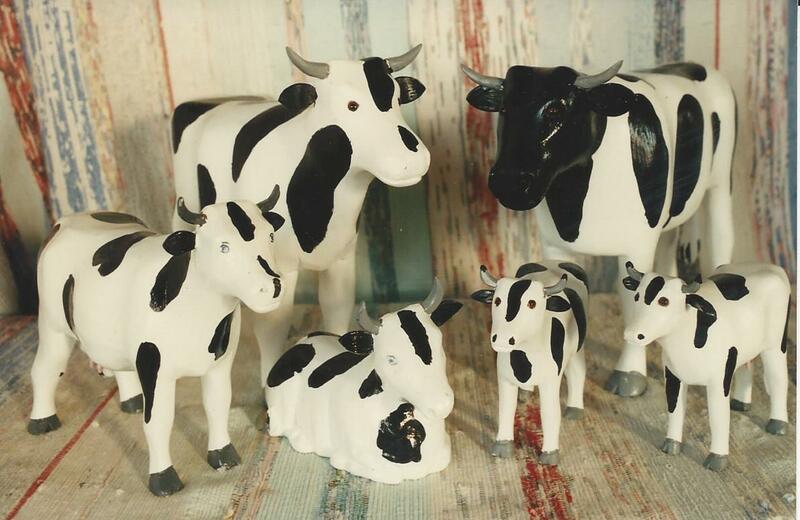 They are fine for decoration when bought at the right price, but should not be confused with “real” folk art, which are items of individual expression, and not mass produced. Although we must also acknowledge that many folk artists, Maud Lewis springs to mind, would repeat favored images over and over again, it is quite different than banging out 100’s of identical ducks using templates and modern wood working tools. Ironically, I think their market has been effected when the Chinese started to reproduce copies of their work. I’ve seen lots of these too. Pierre et Claire continue to be in business, and have a web site at www.pierreetclaireinc.com, but it is in French only, and does not show many of their available carvings.